Over the past few years, nails have become the new hot accessory. Before they were cute additions to your wardrobe, you got them done because it's kind of expected especially if you wanted a complete, polished look. The women were few and far in between who dared layer colors and designs. Some people outright thought it was juvenile. But times have changed as they always do and tiny brushes, stickers, gems and nail polish strips have all made it easy for women (and some men) to really pay attention to what their nails say about them. For this Top 10 Tuesday, I was moved by IFB's Project #12: Nail Fun to see what everyone was doing with their nails and how many people had learned to (in comic book speak) bend nail polish to their will. let's see how this trends adapts. I'm thinking accents. the single line at the top has evolved into plaids and intricate line patterns. we've seen it spread like wild fire across the blogging community. each nail a different color. I heard the 90's are making a comeback. where just one nail is not like the others, be it via color or design. become a nail trend? Haven't tried it yet? There's no shortage of tutorials. and very pretty. I have noticed more use of rainbow glitter though. Blogger Grinning Soul did a tutorial for galaxy nails which made me notice quite a few nails that look like starry skies. It's more than glitter but the color and blending that remind me of space. The detail and technique make these nails masterpieces. Some people use little brushes while others prefer stickers or newspaper. And check out the Missoni inspired nails - that's patience! Polka dots is a classic print that is fairly easy to do. 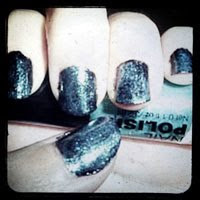 Like tips and glitter, I think this style might also become a nail classic. So are your nails currently following one of these trends? What do you think your nails say about you? Thank you for featuring my nails! :)) Great blog!!! Thank you for featuring my nails too!!! fun blog!